Are you holding a golf tournament and looking for a cool gift to hand out? Or do you market to golfers? 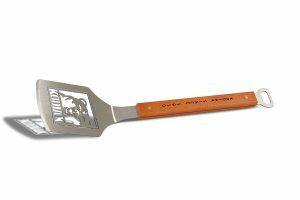 The Golf Sportula with a golfer laser cut in the stainless steel barbecue spatula with your name or event name on the maple handle. This handy and useful item makes this a great gift for golfers and golf fanatics. Up to 19 characters (letters and spaces) can be placed vertically down the handle. The end of the handle has a handy bottle opener. Minimum is 50 pieces at $18.75 ea. No set up for the information on the handle. Made in USA. Item SP-CUSD. 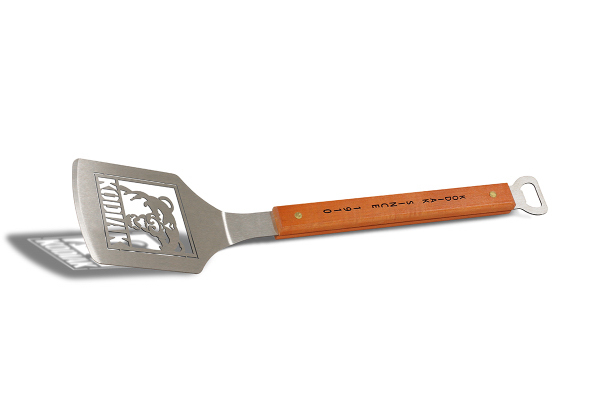 Sportual, spatula with custom logo on the steel spatula and your name down the handle.